For his project, Anderegg drew “transects” – straight lines – through aspen stands and set up alternating 1-meter-square plots on either side. For some of the project, begun in July 2011 near Durango, he was aided by his brother Leander. This aspen understory near Dolores showed sudden aspen decline in July 2011. Shrubs may be replacing aspen before grasses, doctoral candidate William Andereggs study indicates. A Stanford University researcher from Cortez has found unusual patterns of vegetation in drought-killed stands of aspen in the San Juan Mountains. 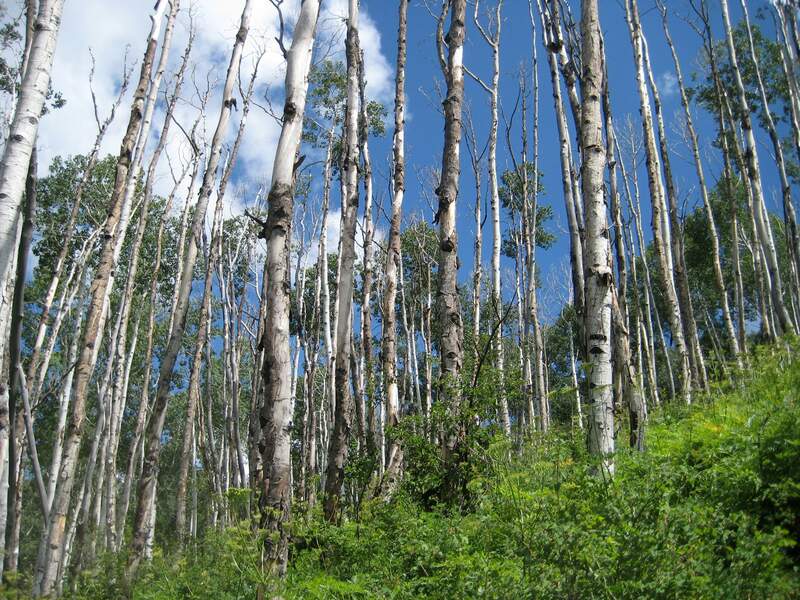 Researchers and foresters label as sudden aspen decline, or SAD, the death of aspen induced by the drought of 2000-03. The phenomenon was observed throughout Colorado. William Anderegg, a biology student who is writing his doctoral dissertation on sudden aspen decline, spent 10 weeks last summer studying plant growth in disturbed aspen forests around Dolores, Mancos, Purgatory and Pagosa Springs. “We found an increase in shrubs such as the mountain snowberry but fewer grasses and forbs,” Anderegg said. “We can’t say definitely that dying stands of aspen favor shrubs over herbaceous communities because we didn’t observe the areas before and after the drought period,” Anderegg said. But he noted that healthy stands of aspen didn’t show an increase of shrubs over the same period, indicating that the trend wasn’t due to a universal increase in shrubs. Anderegg’s research was published three weeks ago in the journal of the Conservation Biology Institute. Mark Krabath, the supervisory forester at the Dolores Public Lands Center, said Wednesday that Anderegg arrived at the right conclusion. Disturbed aspen stands also produce less regeneration, Krabath said. The trend is evident in two recent sales of timber, 300 acres total, east of Dolores. The 10,000 new shoots per acre expected five years after the 2000-03 drought didn’t materialize, he said. The number was more like 3,000 shoots per acre. “It’s a trend seen throughout the state,” Krabath said. The long-term effect could be aspen forests with fewer of the dominant species and more shrubs such as the mountain snowberry, serviceberry and Gambel oak, he said. Fewer grasses and forbs could change the number of cattle allowed to graze in the national forest and affect the ranges visited by deer and elk, Krabath said. 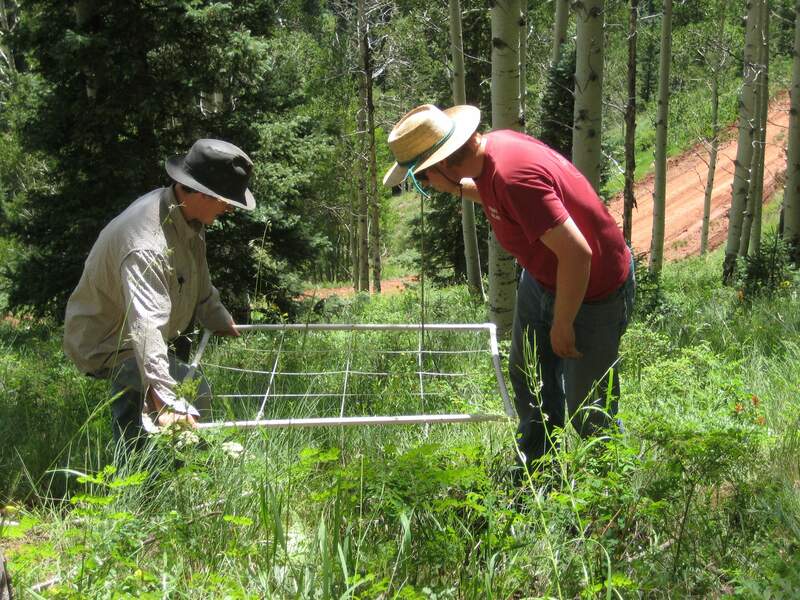 In their field work, conducted in summer 2011, Anderegg’s team members established 55 1-meter-square plots in four areas of the San Juan Mountains. The aspen stands were chosen to reflect a diversity of geography and topography and were located within one kilometer of an accessible road, Anderegg said. SAD plots were defined as those with an average of more than 30 percent crown mortality, Anderegg said. Plots with less than 30 percent mortality were considered healthy. Anderegg said the current drought could trigger more aspen die-off. The latest statistics (2009) show that 600,000 acres of aspens in Colorado were affected by drought, Anderegg said. The number is 17 percent of all aspen in the state. Anderegg said he didn’t find an increase of invasive, nonnative species in the drought-affected aspen forests he surveyed. Research supports what happened there, Anderegg said. Evidence indicates that loss of a dominant tree species from insect infestation of drought-stressed trees brings more nonnative invaders and a decrease in the abundance of species.